Are you planning a trip to this year's Halloween Horror Nights? Then you better pack your pockets full of cash, because Universal Studios is dropping some very cool merchandise this year, and you're probably going to want it all. Things kick off this September, and the theme park is not skimping when it comes to awesome T-shirts and other exciting collectors' items that no horror fan worth their weight in blood and guts can live without. 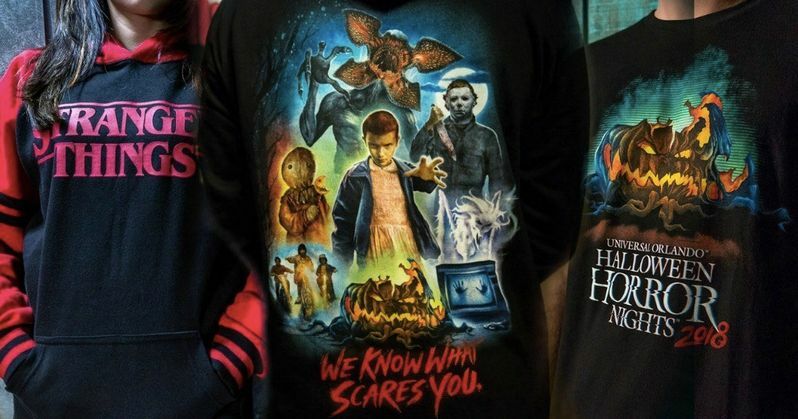 This year, Halloween Horror Nights is planning a big Stranger Things event, and they have some exclusive merchandise to go with it that you won't be able to get anywhere else. Fans will be able to walk the very scary Upside Down maze as they're terrorized by the chittering, predatory Demogorgon. Universal is bringing iconic scenes, characters and environments from the hit Netflix series to life. Those attending the park will be able to memorialize this fun time with awesome new Stranger Things sweatshirts, phone cases, mugs and pins that can't be bought anyplace else on earth, at least not until some folks start selling this stuff on eBay. There is a black and red sweatshirt that sports the iconic show logo. And there is a new T-shirt that shows the Universal Studios arches inside the upside down. Universal isn't showing off all of their Stranger Things merchandise here, though. They are saving some surprises for when you actually get inside the park. Universal is also offering some exclusive merchandise that features iconic slashers, monsters and more. There's a very cool Halloween Horror Nights 2018 T-Shirt that brings together Eleven, Michael Myers and other horror legends from Poltergeist and Trick 'r Treat. It might be one of the coolest designs they're selling this year, and it can be found on hooded sweatshirts, t-shirts, mugs and a whole lot more. There will be plenty of individual merchandise, too, that features any one particular character. And don't sleep on those Trick 'r Treat leggings. They are literally to die for. Universal Studios has also conjured up some excellent exclusives for Annual Passholders that aren't available to anyone else. These include a rotten jack-o-lantern T-shirt and pin. There will also be some speciality items that are only found inside the park, including the fan-favorite hand painted skulls located inside the tribute store. Also, there will be T-shirts and posters that feature this year's scare zones, which is a first. U Design is also bringing Horror Ink to the park, which allows you to choose from over 25 designs for your own customized T-shirt printed on demand. These designs feature characters from the various haunted houses and scare zones in a number of different scary scenarios. There are even some cool 80s throwbacks included in the mix. All of the designs this year have been in the works since this past January, with the idea that fans can finally bring home a piece of the park with them, and remember Halloween Horror Nights forever. All of this exciting merchandise will be available at Halloween Horror Nights at Universal Studios Florida from September 14 until November 3rd. There is no mention of how much of this march will be available at Universal Studios Hollywood, but we have to imagine they'll be selling most, if not all, of it too. Take a look at all that Universal Studios has to offer below.